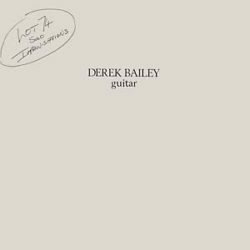 Honest Jon’s Records present a reissue of Derek Bailey’s Lot 74, originally released by Incus in 1974. Recorded at a private house in West London, the side-long title track is a masterwork: a twenty-two-minute, starkly personal, freely expressive, itchily searching re-casting of orders of rhythm and sound into a new, quicksilver kind of affective and musical polyphony. Never mind the guitarist’s championing of “non-idiomatic improvisation”, the poet Peter Riley gets the ball rolling in his identification of the various hauntings of Bailey’s playing at this time: “mandolins & balalaikas strumming in the distance, George Forby’s banjo, Leadbelly’s steel 12-string, koto, lute, classical guitar… and others quite outside the field of the plucked string.” The five pieces on side two were recorded back home in Hackney around the same time — with the exception of “Improvisation 104(b)”, from the year before (and issued by Incus in its TAPS series of mini reel-to-reel tapes) — opening with ventriloquized guitar feedback, and taking in some cod banter about colleagues like Mervyn Parker, Siegfried Brotzmann, and Harry Bentink. Crucial.